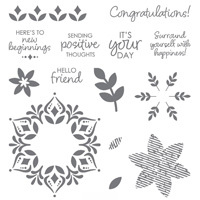 A few days ago I announced Stampin' Up! November promotion - a brand new and time-limited Snowflake Showcase! These products are amazing and can be used for so much more than winter and Christmas. I love these images - they are so versatile for many different occasions. Combine these images with the Tranquil Textures designer series paper and you can create the beautiful and subtle friendship card below. And did I mention that you can pair the Happiness Surrounds set with the Snowfall thinlits? 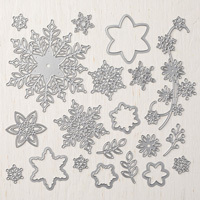 These thinlits also pair with the second set in the Snowflake Showcase, called Snow is Glistening. Check it out on my November 1st blog post, using the link above. Click the link below to head over to my online store - remember these products are only available - as supplies last - until November 30th! Fold Balmy Blue card stock 8 1/2” x 5 1/2” to be 4 ¼” x 5 ½” for card base. Stamp in Balmy Blue ink the “It’s Your Day” sentiment on right end of the Whisper White card stock 3”x2” piece. Also stamp the large flower on a Whisper White card stock scrap. Stamp in Mint Macaron ink the border of flowers, side by side to fill the 3/4” x 5 ¼” Whisper White card stock. Also stamp the small flower on a Whisper White card stock scrap. Use the Sponge Dauber to tap into the Mint Macaron ink pad and then brush the ink along the edges of the 3”x 2” Whisper White card stock with sentiment. Cut a 3” x 2” piece of Multipurpose Adhesive sheet. Apply it over the front of the 3” x 2” Whisper White cardstock to cover the sentiment. Apply Dazzling Diamonds glitter onto the Adhesive layer. Use the Big Shot to die cut the 2 flower shapes from the Snowfall thinlits. Adhere Green DSP layer onto the card base. Adhere the Blue DSP layer as well. Adhere the 3/4” x 5 ¼” Whisper White card stock layer to the card. Adhere the Mint Macaron flower onto the Balmy Blue flower with Liquid Glue. Use Dimensionals to attach the 3” x 2” Whisper White card stock to the card. The flowers overlap the Dazzling Diamonds glitter. Use Dimensionals on the flower petals to adhere to the DSP and a dot of Liquid Glue to adhere onto the glitter.